This tower is known as the Ghost Tower. In 1604, James I presented Warwick Castle to Sir Fulke Greville. Greville then undertook an expensive regeneration programme of the castle and its grounds. He unfortuantely came to a sticky end when his man-servant confronted him over his will. The servant believed that his master should have rewarded him for his years of loyalty. When he realised he was to receive a pittance, he stabbed Greville and then killed himself. Greville spent an agonising month slowly dying of the infections caused by his wounds. 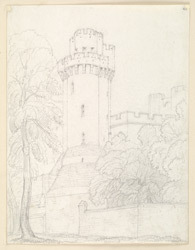 It is believed that the ghost of Sir Greville inhabits the tower and appears occasionally from behind his portrait hanging in one of the rooms.